We created the MochaVinci by breeding our jet Black Ocellaris Clownfish (Darwin) with our DaVinci Ocellaris Clownfish. The MochaVinci Clownfish has inherited the classic swirly white pattern of the DaVinci Clownfish, but the red coloration has been replaced by a more golden and black coloration similar to that of Black Ice Clownfish and Maine Mocha Clownfish. 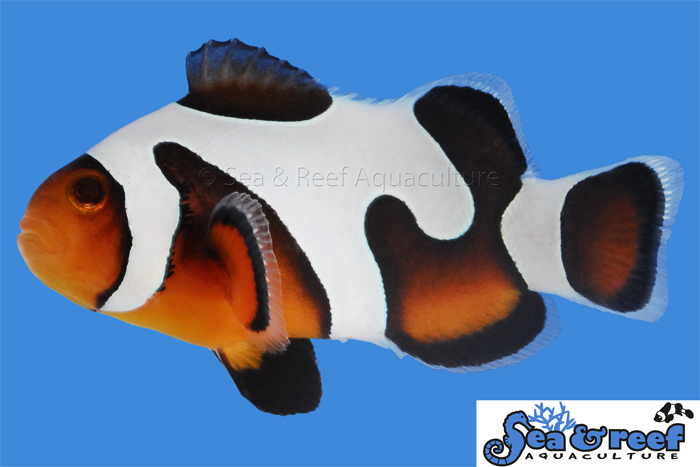 The white swirly patterns fall into the same variations as our DaVinci Ocellaris Clownfish and we are therefore releasing two grades: MochaVinci Clownfish Grade A and MochaVinci Clownfish GradeB. The MochaVinci Clownfish Grade A has at least two connected stripes on each side of the body. The MochaVinci Clownfish Grade B has swirly patterns but the stripes are not connected or connected on one side only. Sea & Reef MochaVinci Clownfish grade A has two fused stripes on each side of the body. The temperament and captive care requirements for MochaVinci Clownfish are very similar to that of the regular Ocellaris Clownfish. It is relatively peaceful and hardy. They thrive in saltwater aquariums with or without an anemone present. MochaVinci Clownfish will readily accept a wide variety of host anemones. As a reference, the natural host anemones of the regular Ocellaris Clownfish are Magnificent Sea Anemone (Heteractis magnifica), Giant Carpet Sea Anemone (Stichodactyla gigantean) and Merten's Carpet Sea Anemone (Stichodactyla mertensii).